Visiting Toronto is like visiting several dozen nations without unpacking your bags. This thoroughly cosmopolitan city offers the sights and flavors of countries on every continent. This travel guide will show you how to visit Canada's largest urban area without spending too much money. Winters are harsh, but Torontonians are too busy to shiver. Most tourists visit in the summer months when prices peak. Consider a trip in the fall, when foliage is spectacular. Prices have fallen by that time, and crowds thin out at the major attractions. If you plan a Spring trip, keep in mind that mild weather sometimes does not arrive until late May. You'll be searching for airfares to and from Canada's busiest airport. 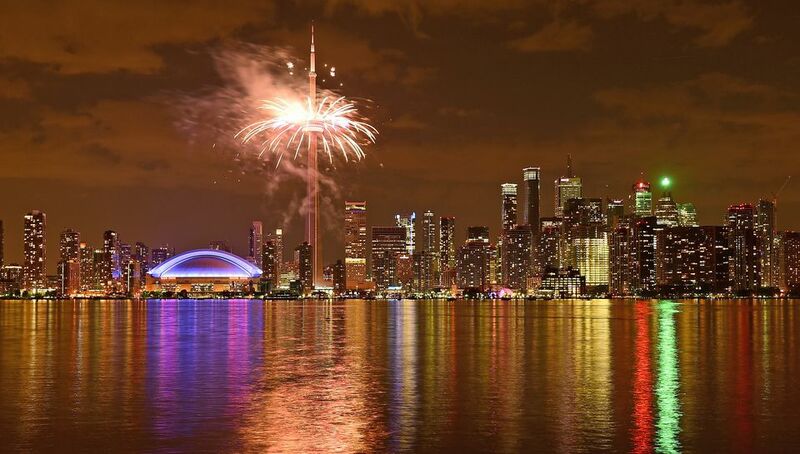 Toronto is one of the world's most cosmopolitan cities. Here you can find restaurants featuring food from almost any point on the compass. Many travelers rave about the authenticity of the offerings from eastern Europe and Asia. It's one of the few cities where, with very little effort, you can dine on a new and striking ethnic specialty every night of your stay. As you search for a room, consider that most of the world's major hotel chains have multiple locations here, with most concentrated near the airport in Malton or in the downtown area. Some budget travelers prefer to snag Priceline deals on the larger hotels along Younge Street, because they can then walk to a lot of major attractions, the subway, and dining. The Toronto Transit Commission operates a network of buses, streetcars and subway trains. It's a clean, efficient network that would be the envy of most major cities. Check out the passes they offer if you'll be in the city more than a few days. Be aware that routes are extended during the summer months to popular destinations such as Exhibition Place, Ontario Place, and Toronto Zoo. If you decide to explore the vast Toronto suburbs, you'll need to rent a car. Toronto's club scene is active and changes quickly. It's best to check local listings after arrival. The theatre district frequently hosts Broadway-quality productions, but you'll also find "off-Broadway" class shows of high quality. Sports fans can take a guided tour of SkyDome. The tour is reasonably priced, but don't expect the same at SkyDome hotels and restaurants, especially if an event is scheduled. Also expensive: a trip to the top of CN Tower, once the world's tallest free-standing structure. Chinatown has become the generic place name of a wide area along Spadina Ave and along Dundas St. West. Chinese, Thai, and Vietnamese immigrants sell native specialties in restaurants and markets. Toronto has two "Little Italy" sections: One along College Street and one to the northwest in Woodbridge. If you choose College, you can stroll into "Little Portugal," too. See how easy it is to sample the world's finest cuisine during a Toronto visit? For a major splurge, consider taking High Tea. The Fairmont Royal York Hotel will serve you the traditional British mid-afternoon treat, complete with pastries and shortbreads. It will cost you about as much as a moderately-priced dinner somewhere, but the upscale experience is something you'll remember longer than an average meal. The Royal York has been serving high tea for generations, so trust them to give you an authentic experience. Look at ToTix for half-priced theater tickets. Much like their counterparts in New York and London, ToTix offers deeply discounted tickets for day-of-show performances. Toronto's version is at the southeast corner of Young-Dundas Square. Sales are done in-person only. Tip: Be careful about waiting hours in line to save money on anything. The time you spend is valuable, too. Check out Saint Lawrence Market. Here is an Old Toronto locale (east of downtown near Wellington and Front Streets, subway to Union Station or King Street) that will inspire those interested in European architecture and charm. The St. Lawrence Market website says Food and Wine Magazine named St. Lawrence one of the world's Top 25 Markets. Taking in the sights is free; enjoying the trendy bistros nearby is not! One more market: Kensington. This place will take you back in time. Sample old-world pastry at one storefront, buy vintage tailored clothing a few doors away. Narrow streets and friendly faces abound. Even if you don't buy a thing, visiting Kensington market is an authentic Toronto experience you won't soon forget. Rail options for Canada begin here. Few places in the country offer rail travel opportunities that rival what you'll find in Toronto. Union Station is located adjacent to the Fairmont Royal York Hotel. It was once the crossroads of Canada, and it still offers some intriguing trips. How about a jaunt to Moose Jaw? You'll probably be more interested in inter-city options: Via Rail Canada can whisk you to downtown Montreal in less than five hours for about $100 CDN one-way. Expect to pay more during prime travel times.